This document is part of a periodical (The Revisionist). Among the concentration camps of National Socialist Germany, Stutthof has remained something of a stepchild. Established near Danzig at the start of the Second World War (and under Polish control since the end of that war), the Stutthof camp is smaller and more remote than Dachau or Buchenwald, and far less notorious than Auschwitz or Majdanek. Partisans of the Holocaust extermination thesis concede that fewer Jews died there than at the major alleged extermination camps, although none of them has contested the anomalous claim that Stutthof had a gas chamber, which allegedly dispatched Jews and other inmates during a few months in 1944. Thus, Stutthof has to date been little studied by either orthodox historians of the Holocaust or by their revisionist challengers. Revisionist historians Jürgen Graf and Carlo Mattogno have remedied this with their concise but substantive study Concentration Camp Stutthof and Its Function in the National Socialist Jewish Policy. The two are patient researchers and careful scholars, noted for their diligence in seeking out records and for their ability, as gifted linguists, to read documents in a variety of languages foreign to most Western historians, including Russian, Hungarian, and Polish. The last of these, of course, is the key to postwar scholarship (such as it is) on Stutthof, because official Polish historians have long been the custodians of what records survive from the camp, and have generated nearly all the literature on its history. Concentration Camp Stutthof is a short book, but admirably organized in terms of the key questions on Holocaust extermination claims as they relate to the camp. 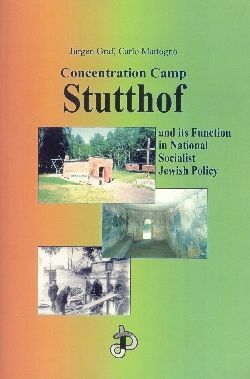 After briefly surveying the state of existing research on Stutthof at the outset of their study, Graf and Mattogno clearly define their main purposes: to investigate the alleged gassings; to attempt to determine how many died from all causes at the camp; and to examine the import of deportations of Jews to Stutthof in 1944. Prefatory to investigating those Holocaust-related questions, the authors provide a brief overview, based on surviving documents, of the camp’s history, which, they show, was pretty much in line with that of most other German camps. In very broad lines, Stutthof first housed Polish political prisoners, later received a large influx of Soviet prisoners of war; finally, though not to the prejudice of its security role, the chief purpose of Stutthof became the employment of its prisoners, including a growing number of Jews, on work crucial to the war economy. More emphatically than most revisionists, the authors concede – and deplore – the high death rates and sometimes brutal treatment that was the lot of camp inmates. They credit the accusation that some unwell inmates, at least, were killed by lethal injection. As the authors write in their conclusion, their "research in no way trivializes the actual sufferings of Stutthof inmates" or denigrates the memory of those who actually died in the camp. Click here for more info and/or to order it now! Reasonable persons might think that such sentiments could provide common ground for revisionists and ‘exterminationists,’ and in a reasonable age Graf and Mattogno might have concluded their study a third of the way through. Given the miasma of unreason that cloaks the history of the Second World War, the authors are compelled to present and examine at some length the official history of the camp as presented in the writings of officials of the postwar Stutthof museum and other functionaries. The authors have little difficulty in showing that the official version of Stutthof’s history is based not on careful examination and dispassionate evaluation of the best evidence available, but rather on those rumors and inventions of the inmates that serve best to impute malicious intent and murderous deeds to the German authorities. That many of Stutthof’s historians were themselves detained there and that most of the place’s historians spent decades as exponents and guardians of a historical orthodoxy that formed part of the state communist ideology would lead any observer to suspect their objectivity; reading the substantial swatches of their version of Stutthof’s history reproduced in Concentration Camp Stutthof is enough to confirm the strongest suspicions. For example, a brief passage quoted from one of Stutthof’s prime official histories, Krzystof Dunin-Wąsowicz’s Stutthof, informs of an SS sergeant Foth who "arbitrarily handed down" hundreds of death sentences (at a time when simple corporal punishment had to be authorized from Berlin). Among the deeds of this Foth, we learn, was beating to death a contingent of women condemned to death by gassing when the gas chamber failed. Dunin-Wąsowicz somehow knows (without revealing his source) that Foth “felt sick if he had not killed at least one inmate during the course of a day’s work." (p. 39 of the work under review) The rest of the official historiography on display here is of a piece, and Graf and Mattogno have wisely refrained from attempting to refute it lie by lie: for anyone who can read and think, the official version of Stutthof’s history is its own best refutation. The authors take more pains refuting the various claims of homicidal gassings at Stutthof, although they are scarcely forced to extend themselves. The gassings are supposed to have taken place mainly in a delousing chamber, while some are said to have occurred in one or more narrow-gauge railway cars that were either stationary or circled through the camp as they did their grim work. The inmates often suspected that they were to be gassed and had to rounded up and forced in, or else deceived into entering either the chamber or the railway cars. Unsuspecting inmates are said to have sometimes been selected for gassing by means of foot races. Graf and Mattogno are easily able to show that, beyond these ludicrous stories from inmates, there is no documentary evidence that either the delousing chamber or the railway cars were designed or used for anything but their official purpose. They handily refute the thesis of the late Jean-Claude Pressac, the only partisan of gassing at Stutthof to offer technical rationales, that the presence of a hole in the ceiling of the delousing chamber indicates a homicidal purpose: much more likely it served to ventilate the chamber (which lacked the circulatory apparatus in more modern German facilities). If Graf and Mattogno’s study of Stutthof went no further, it would be a valuable, if less than scintillating, addition to scholarship on the concentration camps. Their findings on the camp’s role in the wartime German Jewish policy, however, make this book a revisionist tour de force that simultaneously adds to our knowledge of what actually befell many of the Jews who came to the camp and establishes a convincing rationale for the gas chamber hoax. The authors are able to estimate, based on partial records of deaths and on analysis and extrapolation from those figures, that around 26,000 persons perished at Stutthof, rather lower than official estimates but still a high toll. More important, they are able to demonstrate that the Jewish mortality rate was comparatively low, and that Jews died at a lower rate while the ‘final solution’ was in operation than in the latter months of the war, when gassing and other means of mass killing are supposed (by official historians) to have ceased. Stutthof, as the authors show, were Hungarians shipped either directly from Auschwitz or from Auschwitz by way of another camp from June to October, 1944, at a time when the alleged annihilation of the Hungarian Jews at Auschwitz was in full swing. Moreover, as the authors also indicate, a large number of the Jews who came to Stutthof from Auschwitz were never registered as inmates at the latter camp: a fact that official historians long interpreted as virtual proof that such persons had been gassed at Auschwitz. Graf and Mattogno do a great service by demonstrating that the safe arrival from Auschwitz of so many Jews at so obscure a camp as Stutthof at the height of the alleged exterminations has been a major embarrassment for official historians including Raul Hilberg and Danuta Czech, as well as the Polish authorities on Stutthof. The authors plausibly speculate that ambient rumors of a gas chamber were imported by the Jews transported from Auschwitz; quite likely the Stutthof gas chamber claim owes its continued existence to those very inapposite arrivals (although the authors establish that only about two thousand persons, not all of them Jews, are said to have been gassed at Stutthof). Concentration Camp Stutthof thus serves as more than a necessary extension of the revisionist method to a little-studied camp. It is of course – indeed, by virtue of the comparative isolation of the camp and its relative freedom from previous associations – that the book is a model study of the gas chamber allegation. And the authors, too, have made a contribution to the humanitarian history of the camps, fulfilling their stated purpose of rescuing Stutthof’s history from the obscenity of lurid inventions and propaganda distortions. Yet what makes the book valuable above all else, is the payoff on its carefully defined objectives – investigating the camp’s gas chamber, mortality, and role in the NS Jewish policy – by way of carefully researched conclusions that provide a springboard to further investigation as well as add another nail to the coffin of the Holocaust myth. Carlos Porter’s fluid English translation from the German original is of high quality, and contributes significantly to the book’s value. As with many small press revisionist books, copy editing and proofreading, though adequate, have room for improvement. Nearly twenty pages of photographs of camp installations, plans, and contemporary documents enhance Concentration Camp Stutthof’s value to casual and serious readers. First posted on CODOH: July 9, 2012, 7 p.m.